The Sanderson sisters fly again with Funko Pop Hocus Pocus figures. Coinciding with the 25th anniversary of the Halloween film, the witches take center focus in the Pop! Disney set. A cult favorite from 1993, Hocus Pocus (buy DVD on Amazon) offers a tale of three witches from Salem, Massachusetts, brought back to life when the black flame is lit. 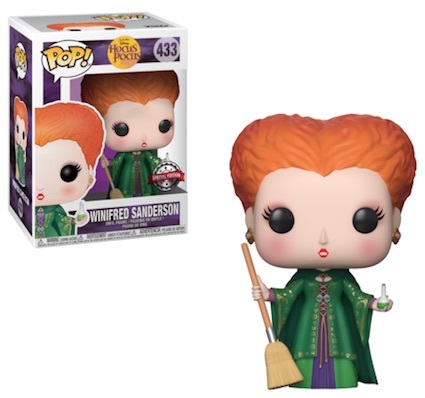 The Funko Pop Hocus Pocus line includes Winifred "Winnie" Sanderson, played by Bette Midler, who leads the group. Her figure holds a broom and a vial with the last bit of the green "life potion." Shop Funko Hocus Pocus Figures on Spirit website. 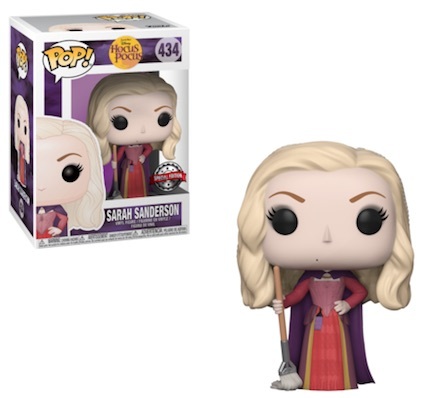 There is also Sarah Jessica Parker as Sarah Sanderson, the youngest sister, who makes use of a mop as her primary mode of transportation. Rounding out the trio, Mary Sanderson (Kathy Najimy) is the middle sister and she uses a vacuum in place of a broom. Keeping to the Halloween theme, the figures are exclusive to Spirit Halloween, a large retail chain and online store that specializes in the fall holiday. 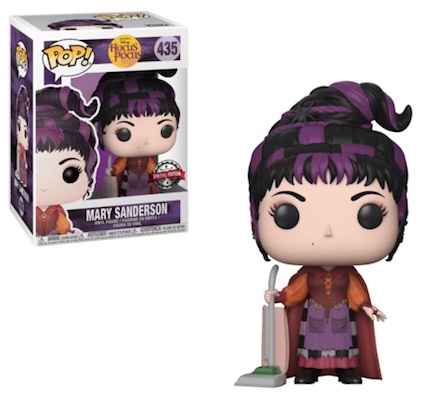 However, collectors will have to wait on vinyl options for Max, Dani, Allison and Binx (the cat), as nothing was mentioned about additions to the Pop! Hocus Pocus set. Hocus Pocus Funko Pop Mary Sanderson 435 signed by Kathy Najimy W COA. Order figures from the Spirit Halloween online store. Hocus Pocus Sanderson Witch Sign & Dish Towel - Halloween Decor - Wall Art New!